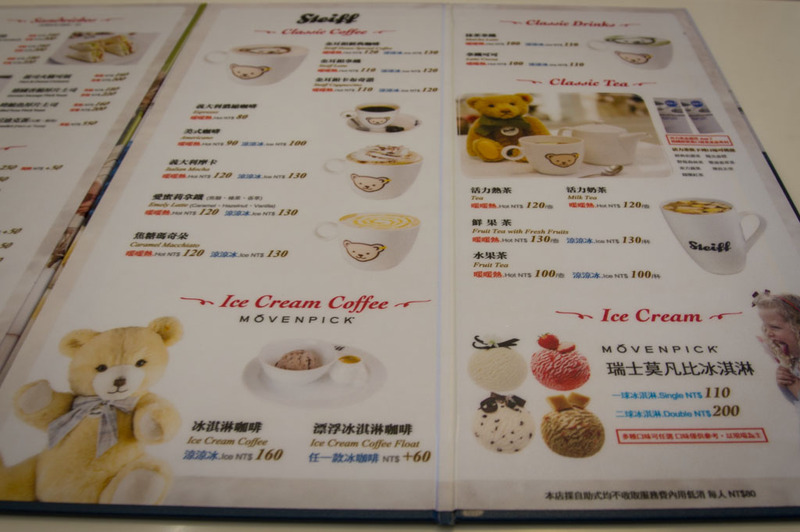 Okay, we admitted there were two times we roamed around that area: Sam 咖啡, because it was too cute and abnormal to close both our eyes and pass, and TENTEN Gelateria, as we are simply curious (end). 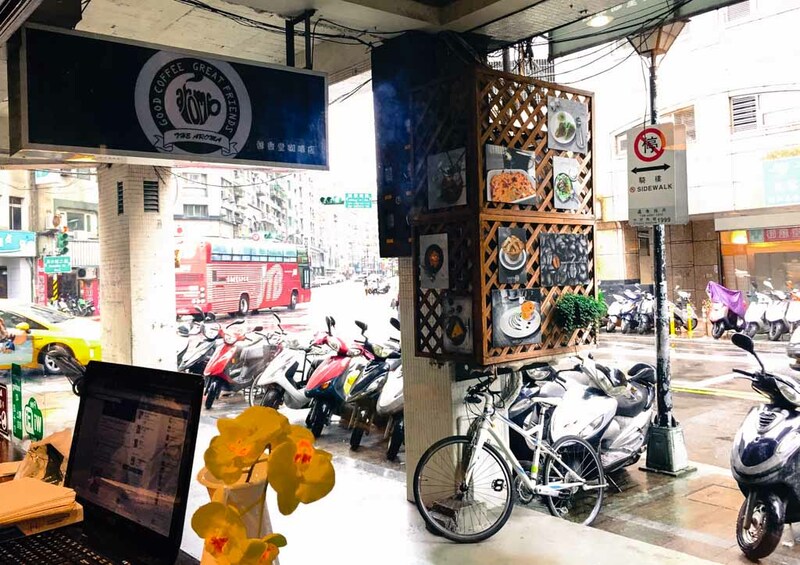 Nonetheless, our reason this time is mainly to celebrate the opening of new SongShan line by reviewing a cute cafe around one of the stops, Nanjing Sanmin. 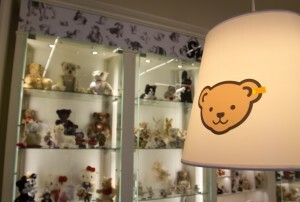 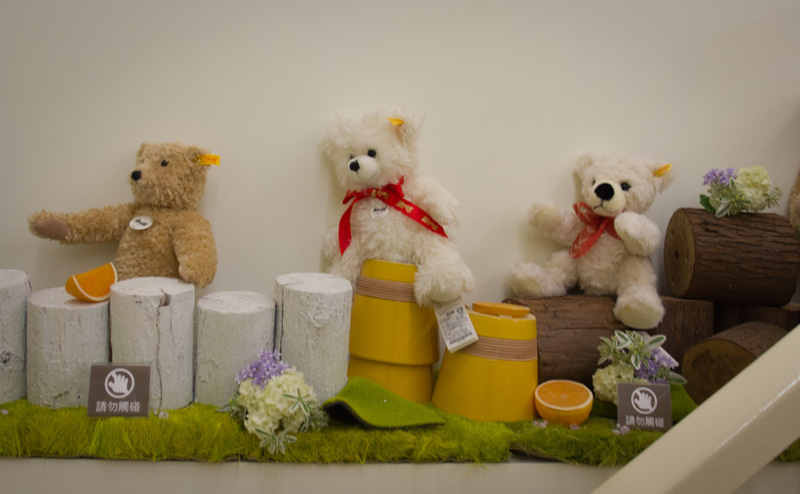 This cute cafe attracts us with its teddy bear character posing at the top of a warm cup of coffee. 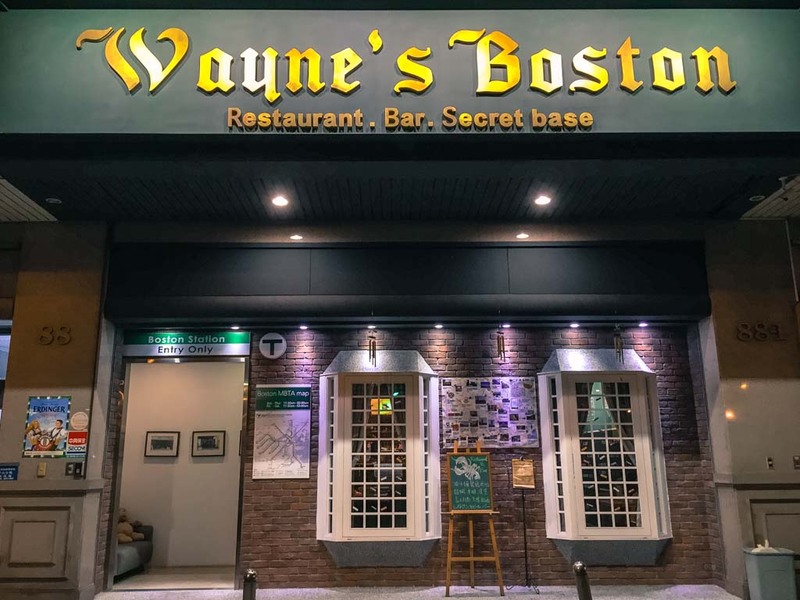 Sounds promising already? 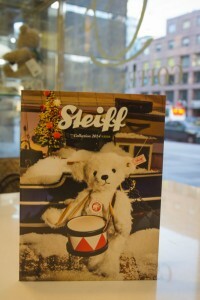 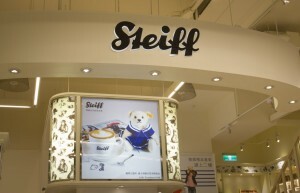 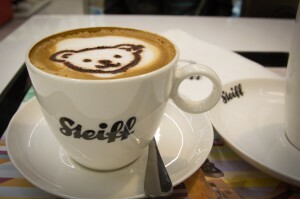 Say hello to Steiff Coffee, then. 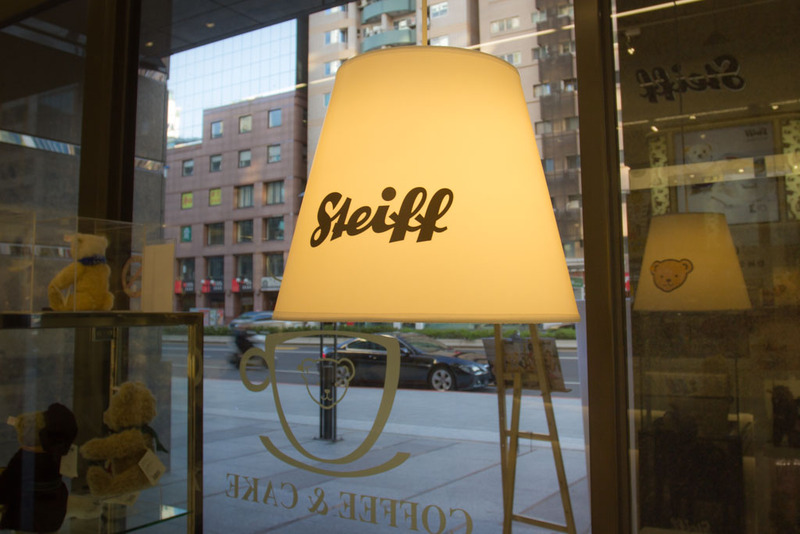 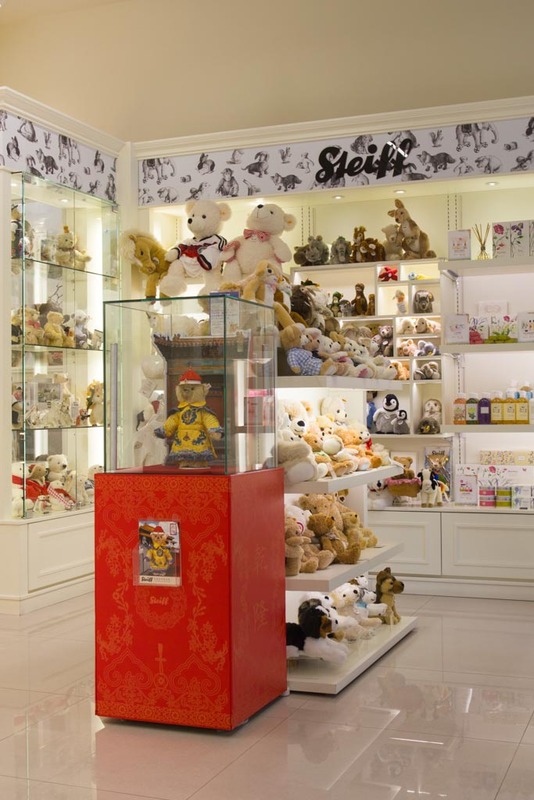 🙂 Steiff Coffee is a small cafe in a kids clothing and collectible-toy store, or it can also put it another way too (we are really not sure which one is their main business). It openly describes itself as coming from Germany. 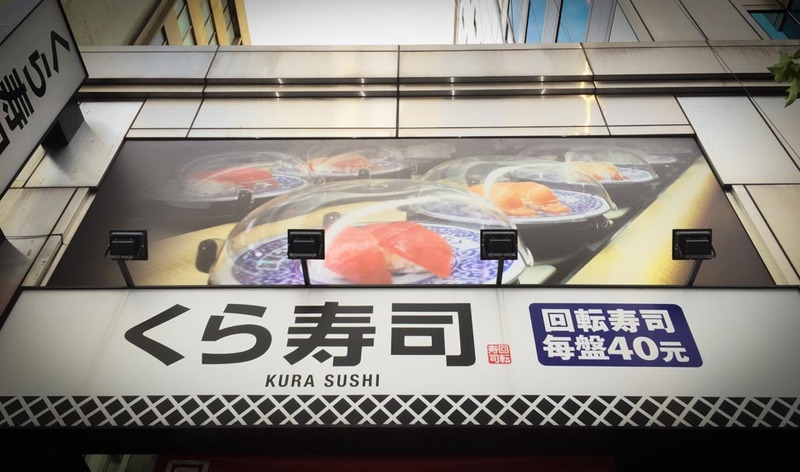 Okay, after writing this sentence I quickly did a bit of research. 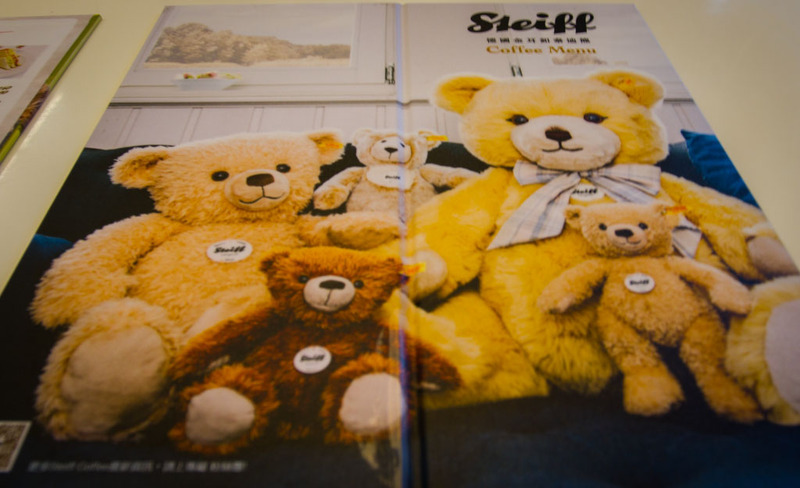 Steiff is actually a real German brand; started in 1880 by its founder, Margerete Steiff – now I got why “Steiff” 😛 . 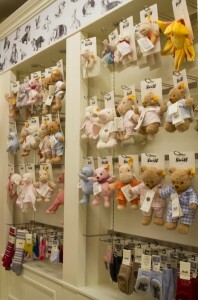 Steiff toys are known with high quality and its distinguishable ‘button-in-ear’ which is as well a sign of its authenticity. 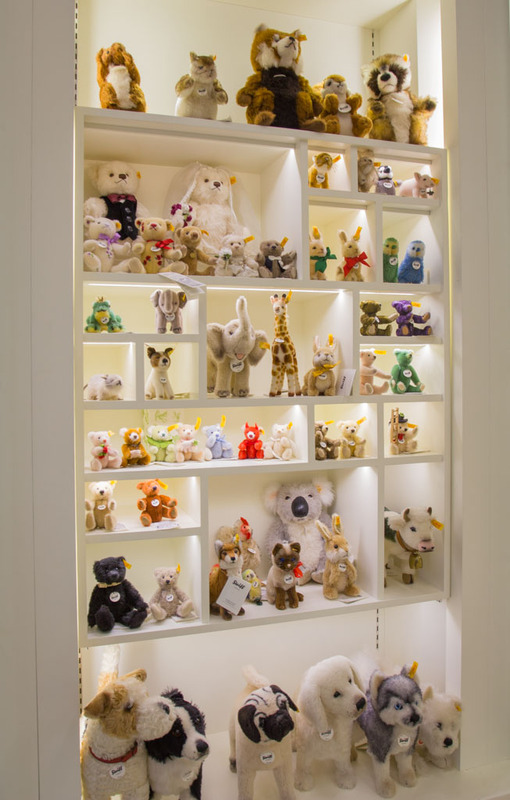 Firstly she started off with elephants, but then it came out big when her nephew joined in and created the famous teddy bears. 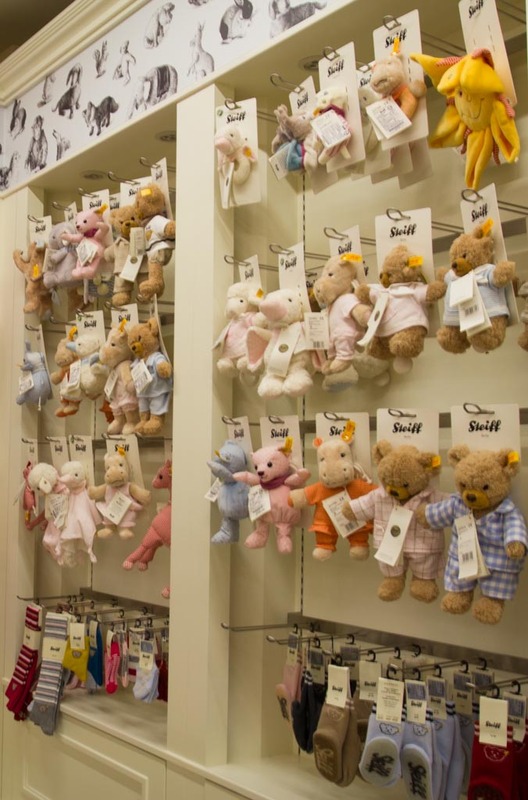 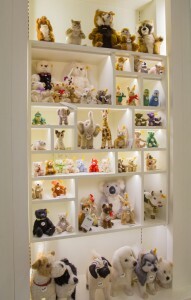 In just 10 years it manufactured almost 1 million teddy bears *wow*. 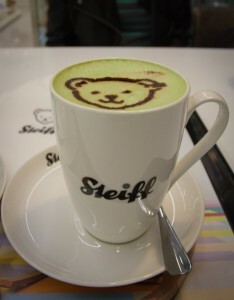 Now back to the coffee talk. 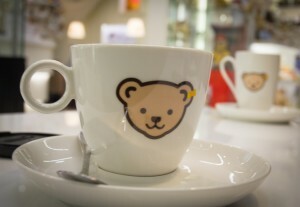 It was Saturday afternoon, very appropriate time for tea time actually. Just that we haven’t had our proper lunch yet and thus were starving. 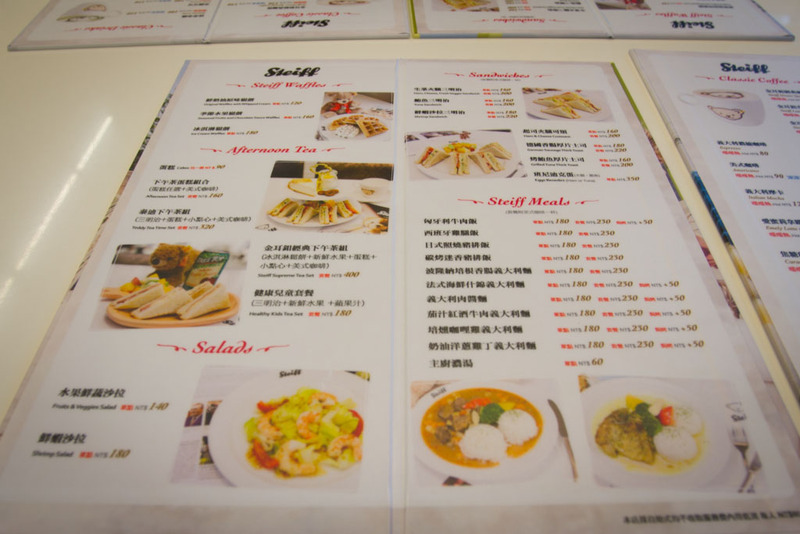 We couldn’t help but order their meals instead of opting for cakes or waffles. 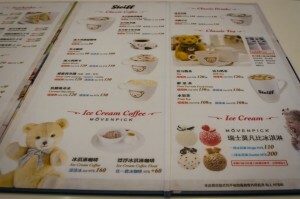 Of course, not forgetting our main motive, we order our coffee (and tea) too. We purposely picked the coffee (and tea) with their trademark bear chocolate powder latte art. 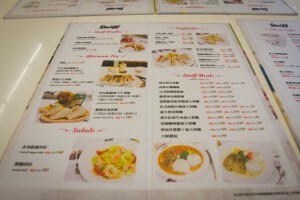 We decided on one rice item and one pasta item to savour. 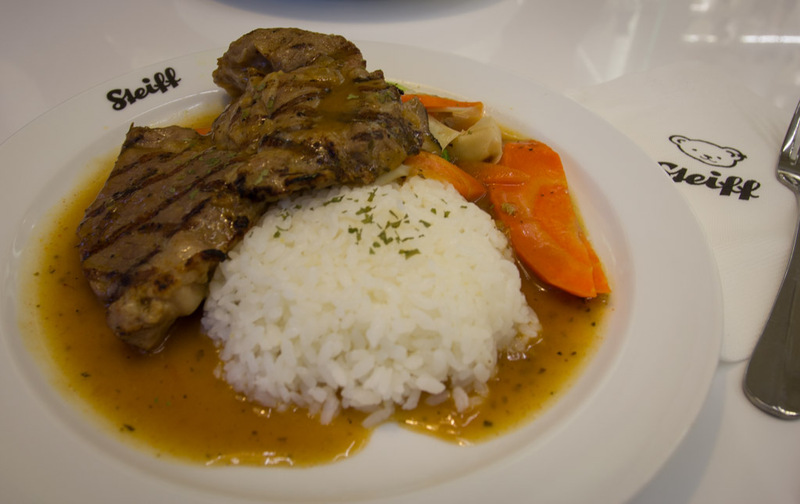 Next thing we know, as some items were sold out, we ended up with Grilled Pork Chop with rice and Red wine-cooked Beef Pasta with Tomato sauce. 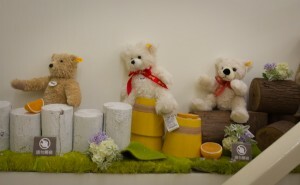 Super cute right? 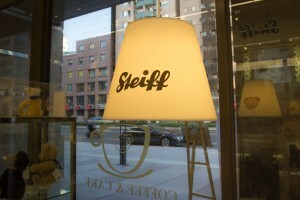 Okay, probably the powder latte art is not that special, but still the cup and lamp design is! HAHA 😆 And truthfully the taste of the food is surprisingly very very nice, albeit it is certain that this is a localization thing (see the pasta? 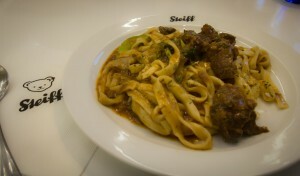 It looked more like chinese noodle). 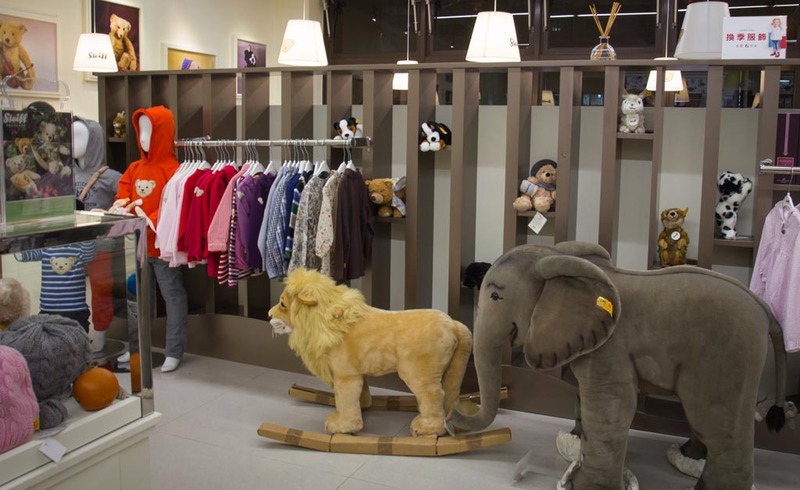 As for the store, besides selling plush-toys on first floor, they also sell baby and kids clothing (and some miniature decoration too) on second floor. 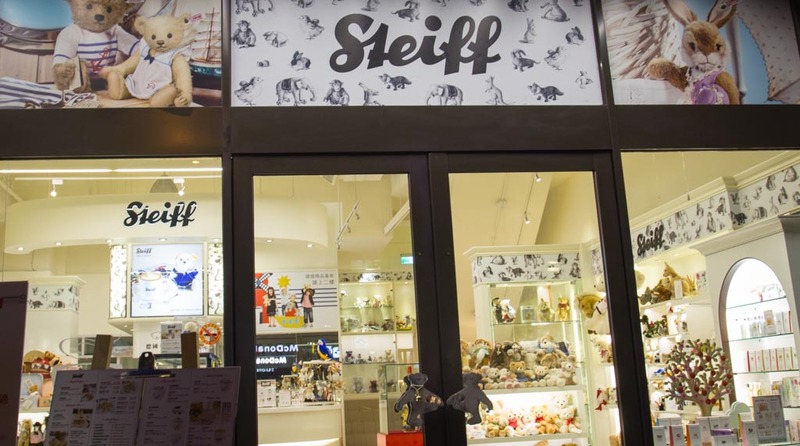 I want to close this review with just a thought; I felt a little bit unfortunate that the space of dining is surrounded with the plushies – wandering if all the cute little things will smell what a pity. 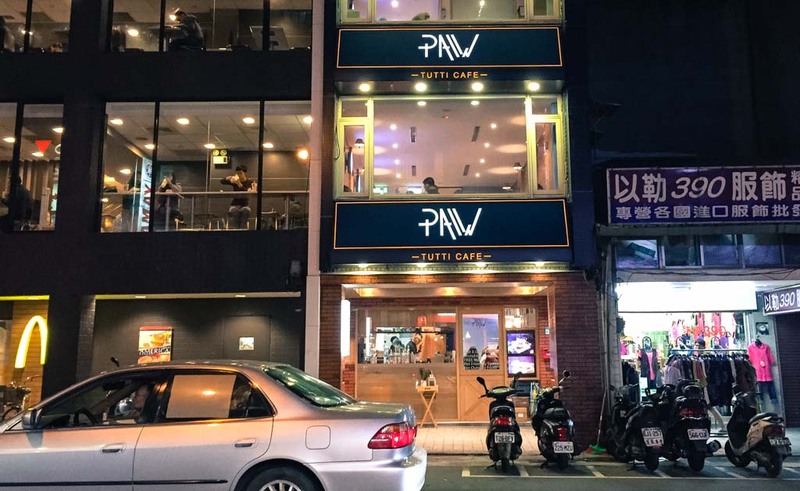 Will you plan a visit there?